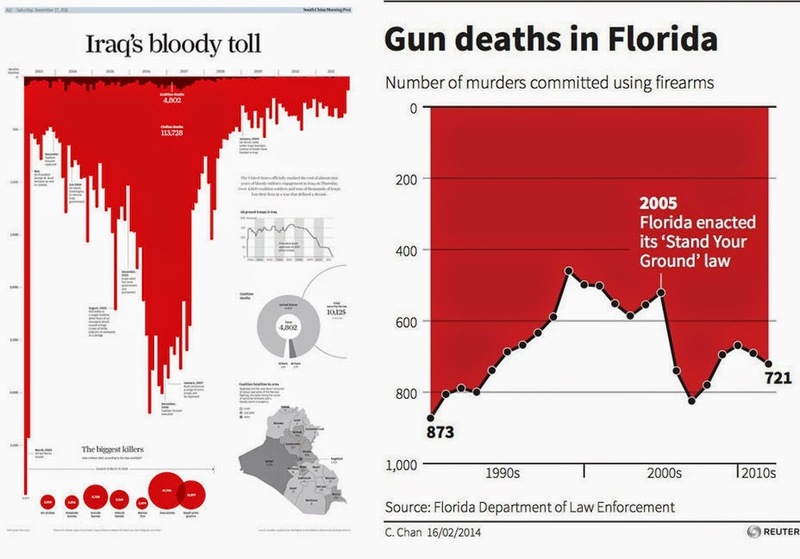 The two charts above (source and source) are being discussed on Twitter since yesterday. Andy Kirk has published a good summary of the conversation. Andy says that if we think that the first graphic works, there's no reason to believe that the second doesn't. I disagree. The first graphic is OK, but the second is misleading, at least at a pre-attentive level. * Why? Because of baselines, gridlines, negative space, and background-foreground relationships. On the first graphic, the baseline on top is very visible, suggesting that all bars are hanging or falling from it. Thanks to this, the metaphor is clear. Andy himself acknowledges it. On the second graphic, eyes get directed to the bottom baseline, as it is so noticeable, being emphasized by the surrounding white. That baseline looks like the ground on which everything else is sitting. Also, the well-defined black data curve makes the white area stand out over the background. It looks like a snowy mountain range over a blood red sky. And we could even mention the headline of the story, which includes the verb "rise." There's not a "rise" in the graphic. It shows stuff falling. This makes matters even worse. Everyone’s own reaction is entirely legitimate. Regardless of whether someone is telling you this is the best or the worst visualisation ever made, how you respond to it and how well you draw interpretations from it are entirely for you to resolve. I’m not defending me here, by the way, just saying we all have different responses based on all sorts of factors such as our experience, knowledge of a subject, interest in a subject, taste and graphical literacy. Well, yes and no. The point here is that, regardless of how knowledgeable you are of information graphics, my guess —let's stress the word "guess"— is that the second graphic makes most readers work hard to get the story. This has little to do with graphical literacy, but with how well we take advantage of the little we know about visual perception and brains. As Jorge Camões wrote: "Cognitive tasks in datavis should complement, not contradict, perceptual ones." *UPDATE: Steve Harod has sent me a tweet about this: "Great post, but I'd avoid pre-attentive explanation. Attention in figure-ground is complicated. Best to avoid guessing cause." UPDATE 2: Rob Simmon has shared this video by Andy Cotgreave. It's worth watching. UPDATE 3: PZ Myers doesn't like Reuters' chart either.